BAGHDAD, Iraq -- Army Brig. Gen. Karen Gibson is quick to dismiss suggestions that she's anything more than "just a Soldier," and she's not a fan of labels, except for one: survivor. As the intelligence director for Combined Joint Task Force -- Operation Inherent Resolve in Iraq, Gibson spends her days working with a team of elite Coalition service members from around the world. It's a job and a deployment nine years in the making. In 2008, then-Lt. Col. Gibson was preparing to deploy with XVIII Airborne Corps. While on a pre-deployment site survey with other leaders to Iraq, she received word that the radiologist at Womack Army Medical Center at Fort Bragg wanted to see her when she returned. "When the doctor said, 'Here's the deal … You've got cancer," I was devastated in ways other cancer patients didn't understand," said Gibson. Contrary to her doctor's initial expectations, Gibson wasn't overwhelmed with the thought of losing her hair or the discomfort of chemotherapy treatments. At arguably the most difficult time in her life, her focus was on her team. "My first question to the doctor was, 'How soon can I go to Baghdad?'" Gibson remembered. "He shook his head and said, 'You're not going anywhere for probably five years.'" "I was so upset I couldn't deploy with my team and the people I had trained with," Gibson said. "It was depressing, and I was despondent over missing this opportunity." Three weeks before her team got on the plane to deploy to Iraq, Gibson checked into Bethesda for the first round of her five months of chemotherapy. Gibson said her faith and her family were a tremendous source of strength. Unbeknownst to her at that time, her determination to beat cancer also provided Gibson's daughter with an opportunity to see her mother in a different light. "Growing up I didn't realize and appreciate how exceptionally strong she was until she was diagnosed with stage III cancer," said U.S. Army 1st Lt. Kelly Chapman, logistics officer, Headquarters and Headquarters Battalion, I Corps. "Watching my mother go through countless physical and emotional setbacks with equal parts grace and grit was a powerful experience." As a career Soldier, Gibson said she also found comfort in the Soldier's Creed. "I relied on the warrior ethos to get me through," Gibson said. "I didn't know how important being a Soldier was to me or how much it shaped my identity until my ability to serve was at risk." As much pride and appreciation as she has for the military, Gibson admitted that when she commissioned as an intelligence officer in 1986, she never dreamed she'd be wearing the uniform so long. "I had no intention of making the military a career," Gibson said. "I was going to do four years, serve my country, and then have a career doing something else." Her original goal was to be an engineer, and following her high school graduation in 1982, the Bozeman, Montana, native chose to attend Purdue University, 1,500 miles from home. "My father told me if I was going to attend school out of state, I had to find a way to pay for it," Gibson explained. "The ROTC program offered a pretty good deal in terms of helping with that goal." 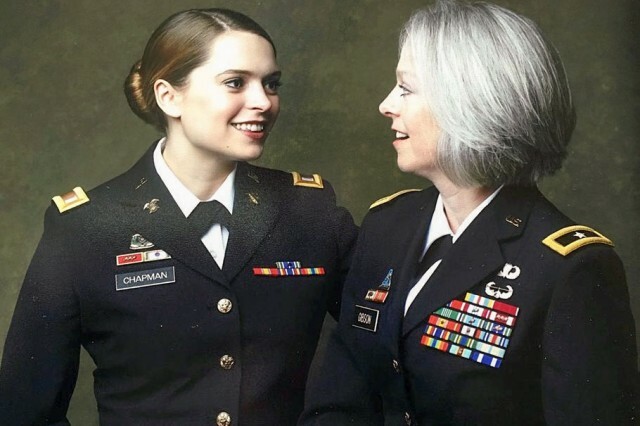 She cracked a smile as she confessed she never gave much thought to being a Soldier, even though she knew there was a service obligation following her time in the ROTC program at Purdue. Looking back, Gibson admitted it took a while for the Army to grow on her. She remembered not being too excited as she approached Fort Huachuca for the basic officer course. "About 30 miles from post, I thought, 'What have I done? This is real, and it better work out,'" she remembered. While sitting in class was not fun, it didn't take long for things to look up for the young lieutenant who was ecstatic about her first duty assignment with the 6th Infantry Division at Fort Richardson, Alaska. "I absolutely loved it," Gibson said with a wide-eyed grin. "As a girl from Montana, the opportunity to spend that kind of time outdoors doing things from glacier training to sleeping in the woods … I just thought it was fantastic." Gibson said being a female in the Army was much different in the late 1980s, compared to today. "There were not a lot of women who served in the 6th Infantry Division," Gibson said. "Once a month all the female officers in the division would get together for lunch, and we could all fit at one round table." Gibson said the opportunities were different during that time for women and recalled a few instances where people would ask her, "What are you doing here? Don't you know women don't need to do these kinds of things?" Most of the time, Gibson ignored those comments, but she never forgot them. "After being in the battalion about four months, I competed in a 10-kilometer artic biathlon which involved shooting and skiing in full combat gear, and I did very well," Gibson said. "An infantry colonel made one of his company commanders give me the crossed rifles from his collar because I beat him." "After that, things got better," Gibson continued. "Regardless of gender, if you demonstrate competency, you'll find that you quickly earn trust and respect." When asked if she had any ambition at that time to serve at the highest ranks in the military, she laughed as she confessed her dream job was nowhere close to serving as a general officer. "For a long time, I burned to be a company commander," said Gibson. "I thought that would be the icing on the cake." Gibson went on to fulfill that goal in the summer of 1995 at Schofield Barracks, Hawaii, for Headquarters and Operations Company, 732nd Military Intelligence Battalion. In the meantime, Gibson married infantry officer Kim Chapman. Following the birth of their two children, Kelly and Tom, Gibson and her husband decided to make the Army a career. "Our goal was to make it to 20 years and retire as lieutenant colonels," she said. "What I love about the Army and what made me stay was the fact that being in the Army challenged every facet of my being," Gibson said. "I've stayed well past retirement because there's nothing else I'd rather do." Gibson stated her drive to be better is something she owes to her family. "My father pushed [my sister and me] hard to achieve, and he told us societal expectations were not going to stand in the way of our goals," said Gibson. Gibson said she's definitely achieved success over the past 31 years, leading at every level and traveling the world, but her current assignment ranks at the top. "Serving here in Iraq has been my favorite assignment," she said. "I work with a fantastic group of professionals, joint and combined, all pulling hard at the oars." Gibson added there's nothing more rewarding or inspiring for her than watching junior Soldiers see their hard work pay off. "I have one Soldier, Spc. Kyra Hall, whose products were among the things on Secretary of Defense Mattis' desk his first day in office," said Gibson. When asked, Hall said of Gibson, "She is definitely at the top of my list of strong women I admire and strive to emulate." The specialist, who supports CJTF-OIR operations in Kuwait, said she never expected Gibson to remember her after just one meeting, much less recognize her out of uniform. Hall said Gibson's actions taught her a valuable lesson about the person and the professional she wants to be. "She remembered who I was and addressed me by name," Hall said. "It made me realize, no matter where I go or who I become, something as simple as remembering someone's name can change someone's day and elevate perceptions of you as a leader." Gibson is also proud of the work done by Spc. Sara Johnke, who Gibson says regularly briefs the Coalition commanding general, Lt. Gen. Townsend and helps inform his understanding of dynamics on the battlefield. "The work we do here is vital and under her leadership, I feel our team has made a real difference," Johnke added. "I am honored to have had the opportunity to serve with Brig. Gen. Gibson, and hope to be as strong of a leader as her one day." Gibson said there aren't many things she hasn't had the opportunity to try in her career, but there's one course that's always caught her eye. "I think I would've been interested in attending Ranger school if it had been open to me because I relish the physical challenge, and because I know it's a premier leadership course," said Gibson. "I like to think when I was younger I would have tried it." Even without a Ranger tab, one would be hard-pressed to argue that Gibson has not done well as a leader, but when asked to reflect on her impact as a female officer, Gibson offered a humble reply, "I don't think about being a woman in the military. I just think about being a Soldier." Although she said there have been occasions where female civilians or service members have cited her accomplishments as an inspiration, the highest ranking female serving in Iraq said she's never really thought of herself as a role model, but don't tell that to people who know her best. "Brig. Gen. Gibson has always led by example, constantly projecting professionalism, confidence, attention to detail and an outstanding work ethic," Johnke said. "She has set the bar high, and as a young Solider, I aspire to achieve that same standard throughout my career." Eight years removed from her fight with cancer, Gibson is still in remission. "It's hard to talk about her as a role model without mentioning cancer because what she did was exceptional," said Chapman. "You don't see many people pull through situations like that and come out the other side stronger and with the amount of determination and passion she still has for her career." Forced to stay behind in 2008, today, she has found vindication deploying with the XVIII Airborne Corps team and serving alongside U.S. Army Lt. Gen. Steven Townsend in Iraq. "I consider myself blessed and fortunate to serve and take on these challenges and responsibilities that the Army has asked me to perform," Gibson said. As the one-time aspiring engineer from Montana turned career Army officer looks down the road, she's excited for whatever's next, which does not yet include retirement, because serving is still rewarding and fun. "I cannot think of another career that could be more fulfilling in every regard than being an American Soldier," Gibson said. "I don't expect it gets better than this."